Do you have Spanish VRS? Yes! We sure do. We call it VRS Español. You or your hearing friends and family can just make a call, and it'll connect directly to an interpreter who can communicate in ASL, English, and Spanish. To learn more, visit here. As you can see in this image below, this is how other VRS Español service work. Hearing Spanish-speaking callers will always need to transfer. However, with Convo it's different! You or your hearing friends and family can just make a call, and it'll connect directly to an interpreter who can communicate in ASL, English, and Spanish. From your end: Your Convo account will be linked with a Español number and you can opt to make direct calls to Spanish-speaking interpreter by clicking on a button. From their end: Your Spanish-speaking family and friends can call you at your Español number and be connected to you directly. They will be connected directly to a Spanish-speaking interpreter without any need to transfer. We have more options to customize VRS Español on your Convo app. For example, you can go in your contact list and turn on VRS Español for each person, so that when you call that person, it will always connect to a Spanish-speaking interpreter. 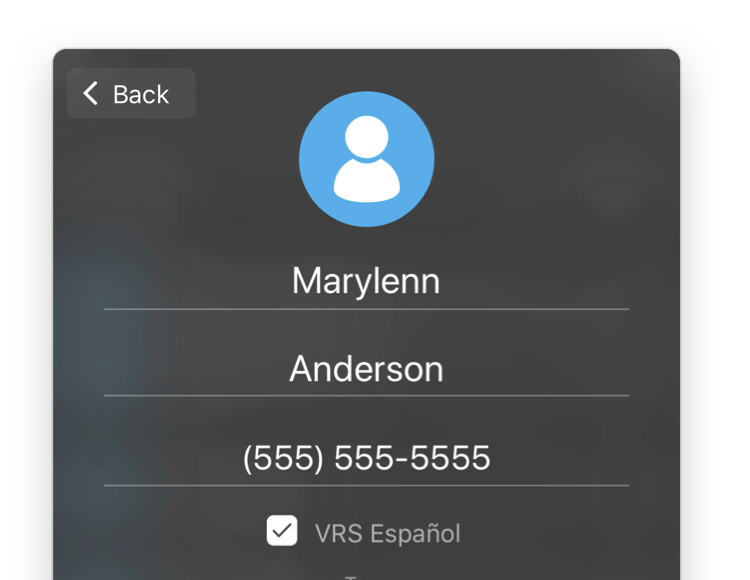 Or you can turn on VRS Español on your app (in Settings) so that ALL VRS calls will connect to VRS Español. You don’t have to keep switching it off or on when you want. Just leave it on, or leave it off. Also, when a hearing Spanish-speaking person calls you, it will always connect to VRS Español. No more interpreter transfers. This is a better experience for hearing callers! How do I switch between ENG & ESP? When you're ready to make your first VRS Español call, just turn on ESP (Español) on top-right corner. It will connect you directly to a Spanish-speaking interpreter. Can anyone who speaks in Spanish call me directly via VRS Español? If you want your Spanish-speaking family and friends to call you, give them your VRS Español number. It will connect them directly to Spanish-speaking interpreter. Simple! Can my app remember who and when to call VRS Español? You can check-box each individual person in your contact list to VRS Español and it will automatically connect to a Spanish-speaking interpreter every time! How do I make it default language? To make VRS Español the default language in your Convo app, just go to Settings and switch it to Español. This will make all VRS calls going forward automatically connect to a Spanish-speaking interpreter. If I switch from ENG to ESP, will it stay until I switch it back myself? If I forget to switch to ESP after dialing can I ask the VI to switch to ESP VI? Yes, you own your call! It will stay on which language you have chosen. Whenever you need to change selected Spoken language, be sure to select before you make your call. The Video Interpreter will not have ability to switch for you.